NewspaperDirect South Africa NewspaperDirect South Africa is licensed to print and distribute over 4000 newspapers from over 100 countries in 50 languages, including important global titles such as The Financial Times, The Wall Street Journal and The Daily Telegraph. 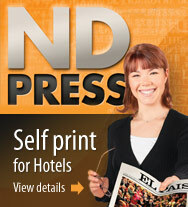 In addition NewspaperDirect is an accredited agent for the revolutionary digital newspaper and magazine solution PressReader. PressReader gives the end user access to exact digital replica's of over 4500 newspaper and magazines, either online via the PressReader portal or by downloading the award-winning PressReader App to their digital device of choice and with it their favourite publication......a whole new green way to access your favourite publications wherever you find yourself worldwide!